Possibly the most comprehensively adjustable pedal delivering a single modulation effect we've seen. A truly comprehensive phaser pedal. Great tones and build. The price means it's probably only for dedicated phaser-phreaks. If you are used to a phaser with one sound and a single knob to change the speed, it's time to be amazed by this pedal. 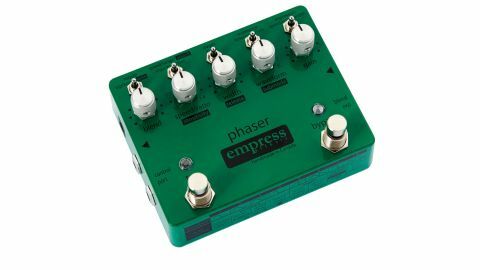 The Empress Phaser has five knobs and five three-way switches, as well as tap tempo, MIDI control and the possibility of using an expression pedal to control parameters. "There are plenty of phaser flavours here, from really subtle to the more obvious"
There's a choice of two- and three-stage phasing besides the more standard four-stage, and you also get a choice of eight different waveforms that offer more angular options than the normal rounded sweep. There are plenty of phaser flavours here, from really subtle to the more obvious, with a defined 'wow' switched in with a resonance switch that offers 'little' or 'lots'. You also get an Auto mode with eight different options for changing parameters in response to picking strength and volume, that's capable of funky auto wah among other things.